A while back, we replaced all of our toilets with dual-flush units in order to save some water. We used WaterRidge dual-flush toilets purchased from our local Costco. At the time, dual-flush toilets commanded some very high prices, and finding them at Costco for less than $200 seemed like quite find. Our fist WaterRidge dual-flush toilet. They have steadily been coming down in price, and the last time I was in Costco, they were selling the same model for $60 -- Amazing! So, if you have been holding off, now is the time. Anyway, we have replaced all the toilets in the house with the new dual flush WaterRidge units, and the oldest one has been in service for about 3 years. No problems of any kind with any of them. I see that several WaterRidge toilets are included in the list, and that some performed much better than others...sounds like you chose one of the better models! It looks like the one they sell at Costco got a 500 rating -- not nearly the best. Ours have performed really well. 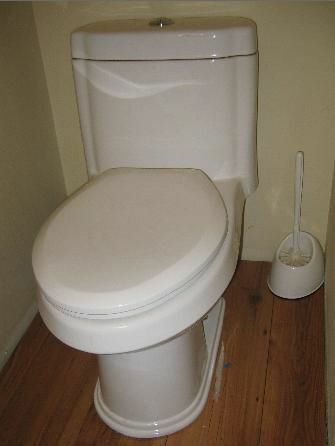 We basically always use the the low flush, which is only a gallon and seems to do the job for all occasions. Maybe the message is that you don't need a 1000 MAP rating to get a toilet that does well. Still kind of amazing to me to see them at $60. Hope all is going well with the solar heating project. We installed a Caroma Sydney Smart dual flush toilet (.8 /1.1 GPF). It rated well in the MaP testing, but we have been disappointed with its operation. It doesn't seem to completely flush liquids when using "half-flush" mode (as evidenced by discolored liquid left in bowl after flushing). But the greater problem is the extremely low water level in the bowl, which doesn't provide much of a 'splash pool' for solids- this results in a lot of 'staining' when flushing solids. Considering we paid around $350 for this ultra-low water use toilet, it was a bit disappointing. We installed a Toto EcoDrake (1.28gpf) model for our second toilet, which seems to be working much better than the Caroma but does use more water. I'm curious if you or others are experiencing these issues with the dual-flush models? We have been quite happy with the WaterRidges we put in. We almost never use the high flush -- the low flush seems to do the job for all cases. There is a bit of 'staining', but I don't think its any worse that our old full flush toilets. Wonder if its worth emailing he MAP test people and asking them exactly what the MAP rating covers? I have to say that on the whole issue of using less water, the toilet replacements were a good and easy step, but I have a strong feeling that a much larger percentage of our water goes for outside watering in the summer. Having a hard time making much progress on that front.